“I’m interested in the difference between the word for clam and the word for cockle, if there is a difference. There is no word listed for cockle. Edward Harper Thomas in Chinook: A History and Dictionary (1935) claims that lukutchee and lakwitchee are singular, and that smetocks refers to big clams. There must have been a distinction between the clam and the cockle. They’re both bivalves, but people who harvested and cooked and ate them must have understood the difference. Have you by any chance come across a distinct word for cockle? The short answer to this well-constructed inquiry is, no, I have not found a distinct word for “cockles”. 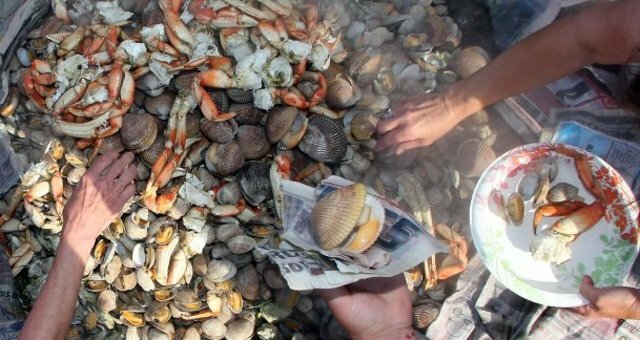 Of course, there are other clamlike words in Chinuk Wawa, such as haykwa and kupkup for the kinds of shells traditionally used as money. But those are a far cry from small edible clams. These results are typical of the Jargon, where we have quite a number of generic terms and relatively few specific ones. The closest we get to something like “cockles” is tanass lakutchee “mussels”–literally “small clams”–from the 1853 Columbian newspaper. And given all that I’ve shown above, that or tanas clams would be the phrase I’d suggest for “cockles”. Lukutchee for “la coquille” (‘the shell’) reflects a dialectal French pronunciation with palatalization of the medial velar into an affricate, before a front vowel. This pronunciation is found in the Canadian Acadian area as well as in portions of the French Atlantic seaboard on the other side of the ocean, from which many Acadian ancestors came. This is interesting since French speakers involved in the fur trade are not known to have had those origins, and French-speaking missionaries would have spoken a more standard variety of French. That’s an interesting point! Most of the palatalizations that we see in French-sourced Jargon words occur on /t/ and /d/. An example is “lasandjel” from meaning “sash, belt”. I’m looking for any further examples of /k/ palatalizing in Jargon. We can imagine for example that the Métis French that prevailed in the Chinuk Wawa environment might not have possessed an everyday word for “seashell” or “clam”, and consequently relied on a borrowing from Acadie. Hm. In Laverdure & Allard’s Michif dictionary, I find no word for “clam”, but “sea shells” is “lee kwacheey”.